"THE body language tells you everything." When Julie Bishop made that comment back in 2016 she was talking about a photo with world leaders from a trip to New York. The scene was tense, much like the events we have seen play out in Australian politics over the past week. Yet today the same could be said about J-Bish. Ms Bishop's body language when she delivered her farewell speech outside parliament said it all. Delivering that speech in the Senate courtyard was a woman with class, sophistication and sass. But mostly importantly, an inspiring "trailblazer" the women of Australia have looked up to. She was the preferred Liberal Party leader, according to opinion polls, and the people's choice of prime minister because of her exemplary track record and the poise she maintained in a political circus dominated by men. During her long career in politics, Ms Bishop has made a mark on Australia, and friends say the reason behind her success is also what sets her apart from other politicians. She was unapologetically herself, despite often being advised not to be. Vogue Australia editor-in-chief Edwina McCann summed it up in 2016 too. "She presents the most sophisticated image on the world stage that Australia has ever presented," McCann observed. "It's an image that a lot of young women would aspire to." She's a lover of fashion and has been adored for her style, but never once apologised for her femininity, and she told Stellar magazine in 2016 that other women should not either. "The most positive feedback I get tends to be from young women, who say, 'That's what I want to hear'," she said. "I don't want to hear that I have to apologise for who I am; I want to be able to back my own intuition, my own judgment, have confidence in my beliefs and who I am. If you are confident, if you are relaxed in your own skin, don't let them define you. Don't let other people define you." If one thing has been clear it's that Ms Bishop has made sure she didn't let the men in the Liberal Party define her. 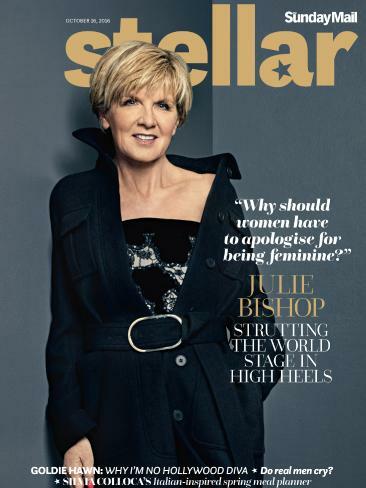 A close friend, leading Perth businessman John Poynton told the Australian Financial Review Ms Bishop's evolution over the past couple of years was the result of a decision to turn her back on a wall of advice on how to look and behave. 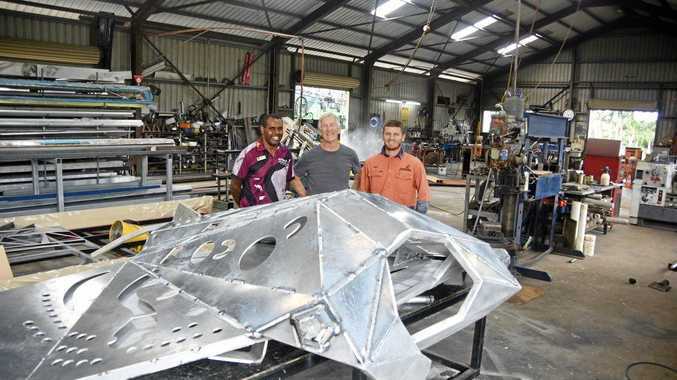 "I think she made a conscious decision a few years ago not to get whipsawed around by other people trying to get her to be someone else," Mr Poynton said. Others concurred, with her partner property developer David Panton saying Ms Bishop's pivotal moment was when she decided to be herself. Mr Panton said her being highly intelligent, articulate and charming meant she persuaded people to support her views. Today, after days of vicious snipes and undermining among her colleagues, when Ms Bishop was asked to comment on the "madness" her friend outgoing prime minister Malcolm Turnbull described, she declined to give her thoughts. "I want to move on from the events of last week. I don't think that it is going to assist the new government if I pontificate on those issues," she said. Australians watching collectively breathed a sigh of relief. Finally, some refreshing grace and diplomacy was on display after having to endure embarrassing and cringe-worthy speeches while the rest of the world laughed at us. It was the speech Australia needed, and it showcased why we have seen such overwhelming support and commentary in favour of the former deputy leader over the past week, and the past years. Both women and men who have admired her, and Ms Bishop knows it. Her reputation goes well beyond political circles. It's that style that's seen Ms Bishop grace the pages of Vogue Australia, Harper's Bazaar and Marie Claire. When J-Bish spoke about femininity in 2016 and women fell more in love with her. Picture: Hugh Stewart. This could have been our PM. Sigh. It's why we've seen pieces this week on her retiring to the backbench in these titles which don't usually cover politics, reflecting on the sadness women have collectively felt across the country. In one piece, Marie Claire wrote when the boys' club froze her out, Ms Bishop did what anyone with a sane bone in their body would do - she left them to it. "And even though we wish she'd hung in to inject the place with a bit of class and calm, it's ironically exactly this logical, level-headed decision which has made many of us realise what a solid player she was," they said. Women commented we had lost the poise and calm of our nation. Mr Turnbull said it first in this goodbye tweet. "Today we have lost Australia's finest Foreign Minister @JulieBishopMP I thank Julie for her loyalty and friendship over many years but especially as my Deputy. She has been and remains an inspiring role model for women here and around the world," he said. And Labor's Foreign Affairs spokeswoman Penny Wong also recognised Ms Bishop "for her trailblazing role" as the first Australian woman to be foreign minister. "Ms Bishop's commitment to standing up for Australia both here and abroad has never been in question". Ms Bishop was all class in today's exit speech from her high-profile role in politics, but she still had one biting response to a question about the Liberal leadership. Asked if she could see a point when the Liberal Party would bring itself to elect a popular female leader, she said: "Well, when we find one, I'm sure we will." This could mean a few things, but if one thing is for certain it's that plenty of Australians thought that leader would be her. Even back in 2015, that Ms Bishop would inspire public confidence was apparent. Another close friend Macquarie WA chairman Mark Barnaba summed up the reason for popularity here. "Julie is simply a class act. She prioritises what is right for this country and its citizens, and what is right for the Liberal Party, above all else. Julie isn't in politics for herself only, and I think people see and respect that," Mr Barnaba said. "I would say she is the equivalent of our Hillary Clinton. In my opinion, Julie has to be the most impressive female politician this country has seen." 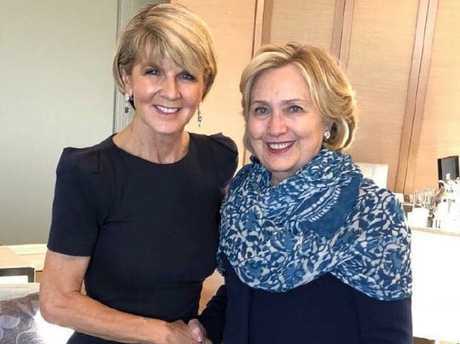 Ms Julie Bishop when she met Hillary Clinton in Sydney. We’ll miss you being front and centre, J-Bish.